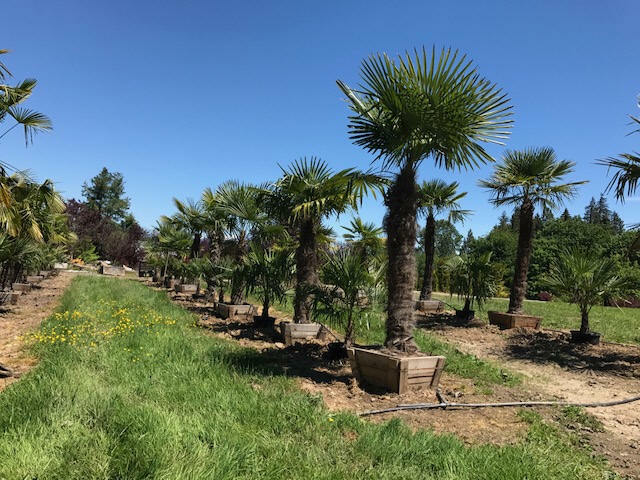 Windmill Palm trees at our Snohomish nursery tree farm. One of the few palms that are hardy in the pacific northwest – these are real attention-getters. They are hardy to 5 degrees although they may lose their leaves in really cold winters. The trunks are covered with a shaggy, coarse fiber and are usually narrower at the base. The canopy generally grows to about 8’ wide. Great around swimming pools and for “tropical” gardens, or as an accent plant. Female plants will sometimes bear large clusters of small blue-black fruits. Soil:. Moist, well-drained. Moderate drought tolerant once established. Comments: Wind and salt spray tolerant once established. Larger Palm Trees are $125 per foot of trunk. Various sizes available. 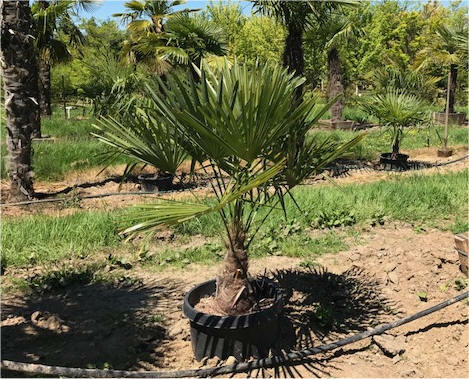 Small "Starter" Palms approximately 4' total height in 15 gallon pot (photo below) are $175 each. Windmill Palms--this is a side view of the photo at the top of the page.